Rene Moffatt wasn’t always a songwriter. Though, he confesses to always being a songwriter at heart. Moffatt grew up in Texas and sang in the elementary school choir while taking piano lessons. He soon switched over to sports, ultimately landing himself a gig as a collegiate soccer player for three years. But being an athlete never stopped him from playing the piano. Moffatt spent most of his college years on the east coast, returning to his home of Texas and eventually graduating with a degree in communications and design which he has since put to good use. After six or so years of doing what he calls “non-music” work, he knows it wasn’t wasted. In fact, Moffatt can be viewed as a musician of all trades. He is responsible not only for all the songs on his latest release “Here and Now is Home” (which is now available on iTunes), but for the posters, fliers, and branding he’s brought to his individual product. 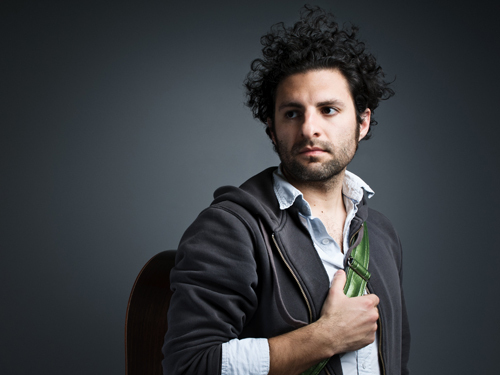 Moffatt took a few minutes to share his musical journey with We Love DC. Here’s a recap of that conversation after the page break. Rachel Levitin: You weren’t always a songwriter. What got you started? Rene Moffatt: That being said… it all started in November of 2005 when I realized that my heart was in songwriting. I began writing and started taking guitar lessons (couldn’t play guitar prior), moved to DC and began three years of guitar study at the Levine School of Music in Northwest DC. 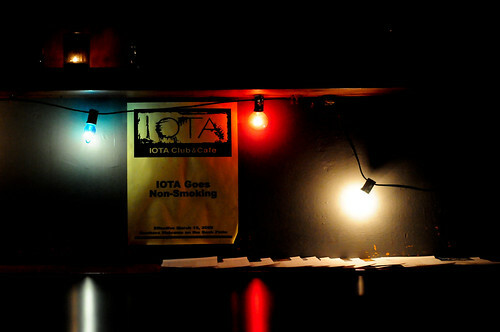 I played my first open mic at IOTA in May of 2007 and have never looked back! … except when answering this question, of course. RL: What brought you to DC and keeps you here as an aspiring songwriter and performer? RM: Like most, my decision to move to DC was entirely career related and had nothing to do with music. But the move proved extremely beneficial for my development as a songwriter. I was most fortunate to have stumbled upon Levine School and their outstanding faculty gave me a great foundation in technique and performance. DC is the perfect city to start out in as a songwriter. Lots of open mics, showcases and venues to refine your chops as well as an incredibly supportive community of musicians to surround yourself with. Many of my fellow songwriters agree that if we had emerged in the more traditional music hotbeds like Austin, Nashville, LA, or NYC … we wouldn’t have been provided with as many quality opportunities in our early songwriter careers. Our growth may have been slower due to high competition and artist saturation that exists in the aforementioned cities. Lastly, there are many opportunities to actually make money playing your own original music in the DC metro area. Which isn’t always the case in other markets. This unique feature allows songwriters like me to work part time and pursue music to the fullest of their extent.. which can eventually lead to that coveted full time music career. RL: How would you describe your songwriting and performance style? Are there any musical influences you really take to heart when it comes time to take the stage or rehearse? RM: I play soulful, acoustic, folk-rock in the realm of Ben Harper, Jack Johnson, and Jackson Browne. My songwriting is primarily influenced by the introspective songwriters of the 60’s and 70’s (Jackson Browne, Paul Simon, McCartney, Lennon, Dylan) and my music is based off my love of great melodies and is heavily influence by Billy Joel, The Beach Boys, Beatles, and Eagles. I primarily play solo so hearing great acoustic performances leaves an indelible mark. To be able to command a room with an acoustic performance is one of the most compelling things you can do as a musician.. and that effort is hardly ever lost on the audience. RL: Your songs tend to be lyrically driven and tell a story, as is evident on your newly released album “Here and Now is Home”. What comes first for you in the songwriting process — music or lyrics? RM: I’d say its 60:40/music:lyrics for me. If the music comes first I’m quick to add a lyric-less melody line to which I write lyrics to later. But almost as often I’m free writing and a phrase presents a lyrical hook or rolls off the tongue well. This immediately launches me into a search for the underlying chord progression. At that point it’s literally a back in forth process until lyrics and music compliment each other and develop into a verse or chorus and then song. I don’t think I’ve ever written an entire set of lyrics or entire piece of music on its own. I love the subtleties of tone, which can be set by either music or lyrics. So, I prefer allowing the interplay between the two which I feel merges the lyric and music seamlessly. RL: Speaking of lyrically driven songs, it looks like you’ve finally done what so few others have done before — write a song about DC! More specifically, you wrote a song about the Metro and the 42 bus. What gave you the inspiration for the song? RM: I used to ride the 42 bus back and forth to work as well as to my girlfriend’s apartment. That bus essentially became my connection to the rest of the city as its route dissects a large portion of DC. One day, while riding the bus, a lyric popped into my head, “Love that 42, the one that brings me back to you.” I jotted it down but dismissed it thinking, “Why would I write a song about a bus route.” But a few weeks passed and I realized that it wasn’t just about a bus route, but it kind of represented a snippet of city life that we all endure. At this point it’s appeal as a song became evident as I figured many DC residents would relate. I soon began working on the song and am extremely happy with how it came out. I get a great response when I play it within DC. But if I play it in Virginia you can hear the crickets chirping … while VA residents have great public transportation, riding the bus isn’t as integral to their livelihood as it is to DC folk. Listen to “Route 42” here. The song appealed to me in another way as well. I never thought I’d actually write a song about living in DC because I’ve never been overly sentimental about living here. Maybe its the city’s transient nature, but it’s not like I was going to rewrite a DC version “New York State Of Mind”. It just wouldn’t work that way. I think of “Route 42” as being more of a snapshot (insert tourist joke here) of DC living as opposed to trying to write a song that encompassed everything about DC. Which would invariably end up sounding like a local version of “We Didn’t Start The Fire”. Did I mention Billy Joel was an influence? RL: The songwriting community in DC is exactly that, a community. Talk to me a little bit about the friends you’ve made after starting out as colleagues. How would you describe the support-system that songwriters provide each other with in DC? RM: The majority of my musician colleagues and friends got their start in and around the DC area… so I feel like we grew up together in that sense. Very familial, like we are all brothers in sisters. We’ve headed in our separate directions as each songwriter’s style had become more refined and our unique musical journey’s are revealed. But it makes getting back together for gigs, parties, or coffee that much more meaningful because you are genuinely happy for the others musical success. We all go through so many of the same trials and tribulations, whether that’s recording, dealing with bandmates, the writing process, or transitioning into to new stages of life. So there is a base level of understanding that is highly supportive. RL: What are your plans moving forward — are you thinking about touring, video making, or are there any exciting projects on the horizon? RM: Ah, it always feels like there is so much going on, so many opportunities. Its just a matter of which ones come to fruition. I see myself as a musical entrepreneur at times and new ideas come daily. It’s fun to throw them up on the wall and see what sticks… like pasta! Lots of tours planned. Going south for a “Tour of Texas” in late June. And I have plans for Midwest, Southeast, Northeast and even West Coast tours. I’m looking forward to getting out of town since I forced myself to stay put over the last few years as I worked on my album and performing. I received a grant from the DC Arts Commission to shoot a video for “Route 42” which I’m excited about. And I’m looking to become more involved with the local music scene as I feel there is a lot of music here locally that goes unnoticed. I’m just trying to play my part in raising the national profile of DC as a music-centric market. We’ve made great strides especially over the last couple of years, but we can do a lot more. It’s an exciting time to be playing music in DC and I’m working on making the most of that. RL: And, of course, the most important question … why do you love DC? RM: I have to admit that I’ve always been drawn to DC because of how much power and influence there is here. It’s a product of the politics and is easy to get caught up in the allure of importance. But unless you are destined for that life, you soon begin to carve out your own unique livelihood. Once you’ve lived here for longer than two years and become a “local” you realize that so many people just happen to live here and don’t have anything to do with politics, military, or government. I love DC because there is a small town underneath it all.